Led by Resident Artist and Project leader Jerry Beck, this new program combines art and science to focus on creative, social, and ecological strategies that expand Beyond Benign’s educational mission and goals. Beyond Benign’s Art and Science Program will be a catalyst for personal, social, environmental, and political change. It will provide a dynamic platform for communicating the importance of art and science and creating ideas, responses, and solutions for many of society’s environmental challenges. The program will encourage students of all ages, backgrounds, and abilities, to make positive contributions to their health, school, neighborhoods, community, and the world around them. 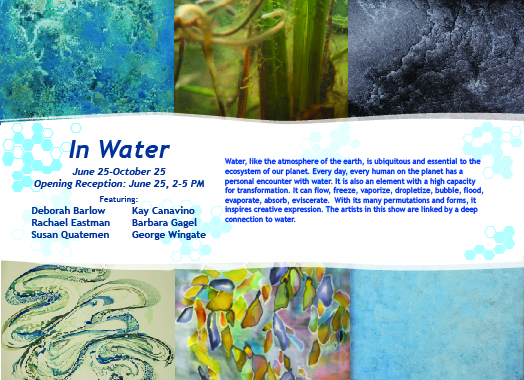 Wilmington, Massachusetts—Beyond Benign, an educational and advocacy organization devoted to green chemistry and a sustainable future, will host an exhibit of art about water in its many permutations. The exhibit will open with a reception on June 25 from 2-5pm and will run through October 25. The exhibit is cosponsored with The Revolving Museum, a longstanding artist activist organization in the Boston area. TRM uses a nomadic nonprofit model to create public art, educational programs and meaningful dialogue between artists, students and the community. “In Water” includes works that are highly diverse in form and intention, ranging from the abstract and subjective to the political and ecological. The wide range of work expands the collective reverence, respect and awe for the role water plays in the planet’s ecosystem. Artists participating in the exhibit include Deborah Barlow, Kay Canavino, Rachael Eastman, Barbara Gagel, Susan Quateman and George Wingate.